50 Years of Marc O'Polo, ISBN: 9783961710256 - available from Nationwide Book Distributors Ltd NZ. A wonderful journey through five decades of corporate history of one of the world’s leading modern casual brands. A book that makes fashion fun—a treasure trove of ideas and inspiration for designers and fans of modern casual fashion. An exclusive coffee table book of the highest quality! The Marc O’Polo success story started in 1967 with two Swedes, an American, a strawberry on an advertising poster, and an O’. When Rolf Lind, Göte Huss, and Jerry O. Sheets started Marc O’Polo 50 years ago, they wanted to conquer the fashion world with natural fabrics and products that came from Asia to Europe. While the fashion industry was still very big on synthetic fabrics in the 1960s, the three co-founders laid the foundation for an emphasis on the natural materials that shape the brand to this day, not letting anything derail their philosophy. And success proved them right, especially under the leadership of today’s owner Werner Böck—their friend, business partner, and loyal companion from the very first days on. In 50 Years of Marc O’Polo – The Book, witness the exciting milestones of Marc O’Polo’s 50-year history–the fashion, creativity, and lifestyle–and discover how the brand became one of the most successful and recognized fashion houses in Germany. The company’s unique history is shown using never-before-seen fashion photographs, smart products, and courageous advertising campaigns. Inspiring quotes and charming anecdotes from those who put their blood, sweat, and tears into establishing and strengthening a label that is the epitome of casual fashion, as well as the committed founders, employees, and competitors, give this account an emotional and personal side. It’s a story about what makes a brand great, marked by an unconditional love for materials, fabrics, and details. 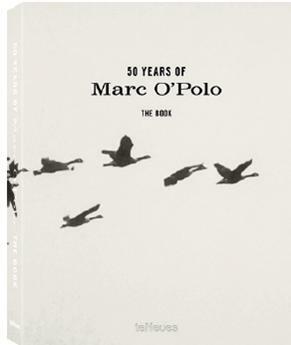 50 Years of Marc O’Polo – The Book is a remarkable history of one of the world’s leading brands. Discover 50 years of O’.